While March was expected to see a jump in hourly earnings from February - which happened as expected, thanks to a 0.3% increase in hourly take home pay, and 2.7% Y/Y to $26.82 - payrolls were set to slide, if perhaps not as aggressively as the 326K to 103K drop revealed. Still, March marked the 90th straight month of U.S. job growth, the longest such streak on record. 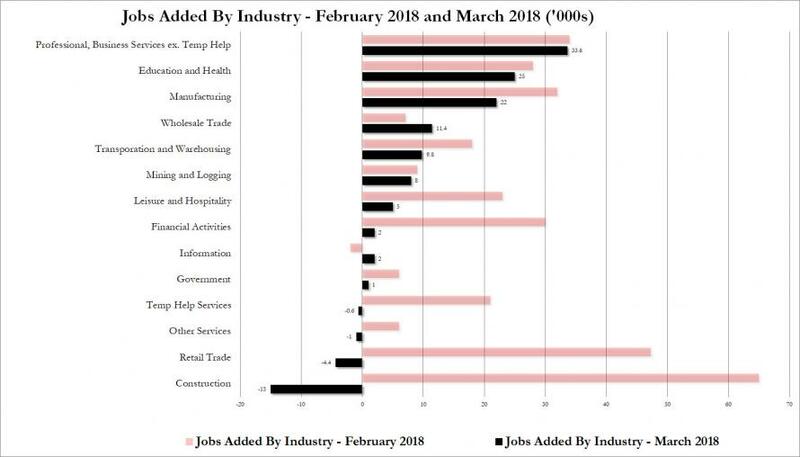 So with strong wage growth once again taking place, which sectors were responsible? Not surprisingly, it was all of the high paying jobs while minimum wage industries barely contributed. 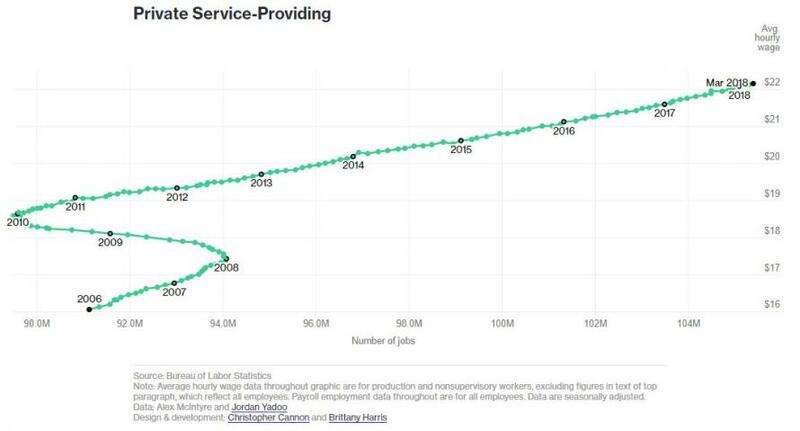 Even the traditional laggards, financial services and information, added 2K jobs each. At the same time, the minimum wage retail trade and temp help saw a drop in employment in March. Hourly Earnings y/y crept up from 2.6% to 2.7%: In a related fashion, Overtime Hours held at cyclically high levels, although down a bit from February (it fell from 3.7 hours to 3.6 hours). The slight dip in overtime is likely snowstorm related: the biggest drop came in the Construction sector. But if you believe, as I do, that Overtime Hours is the strongest indicator of pending wage pressure, then the trend needs to be watched. Wage pressure will remain softer than expected because of the use of teenage labor (which is minimum wage labor). For this age group, both the participation rate and the employment rate have increased. Finally, the Bloomberg chart below shows how shifts in employment have coincided with changes in average hourly pay from one month to the next.